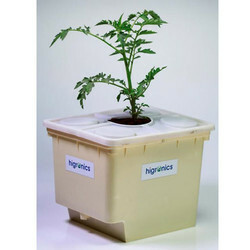 Pioneers in the industry, we offer higro plastic dutch bucket from India. Higro Plastic Dutch Bucket are designed to be fed by drip emitters and plumbed to drain using a common 1.5" PVC pipe, purchased locally. Siphon Elbows, sold separately, regulate safety reservoir of nutrient solution at bottom of bucket to 1" deep. This feature prevents growing medium from drying out and causing water stress between irrigation cycles. Siphon pipe also prevents over accumulation of nutrient solution. Each bucket requires two Siphon Elbows (sold separately). Dutch Buckets are available in tan only. Ideal for tomatoes, cucumbers, peppers, scallions, basil, other herbs and more. Looking for Higro Dutch Bucket ?